At one time I would have thought this meant, “Do what you want.” So in the balance between watching my daughter play low-quality lacrosse and backcountry skiing through local powder, the choice would have been easy. After many years of marriage, however, even my slow-fire brain has caught on. It’s OK to go skiing … if I like sharing my bed with the dog. Still, it’s really not OK not to ski. The work week has had its frustrations and mind and body need an escape. For exercise. For fun. For a mood boost. For inspiration. For a connection to greater things. For a transformation from frustrated fiend to home-worthy human. Tom is always game and we’re moving up the trail the next morning on skinned skis before 7 a.m. – plenty of time, I think, for the ascent, and for the unexpected…like getting temporarily bewildered by the many rolls, sinks, and mounds that make the topography beyond Clara Lake confusing to navigate. We make good time up the well-used trail leading to Clara Lake then cut fresh tracks through the larch glades beyond as the sun illuminates the landscape with lemon light. The uphill travel here is pure pleasure as we weave through the massive tamaracks with their twisted crowns, bare branches, and jig-saw-puzzle bark. We stride on steadily and the trees shrink in size while the views over the Columbia Valley grow. As expected, the topography tosses us a few curveballs and we squander some time searching for, yet failing to find, the most elegant line to the summit. Still, we’re on top shortly after 9 a.m. Layers of high clouds are streaming in from the west and low valley clouds smother the hills below. Sandwiched between these cloud layers rise the snow-covered profiles of Mt. Rainier to the south, Mt. Stuart to the west, and Glacier Peak to the north. The wind rushes over our peak with frigid persistence and we shiver in down coats, but a little frozen misery doesn’t dampen the experience. How much sweeter is this morning cup of life than a few extra hours of sleep and the saccharine of morning caffeine to energize the spirits. We ski back to Clara Lake through a mixed bag of spring conditions. 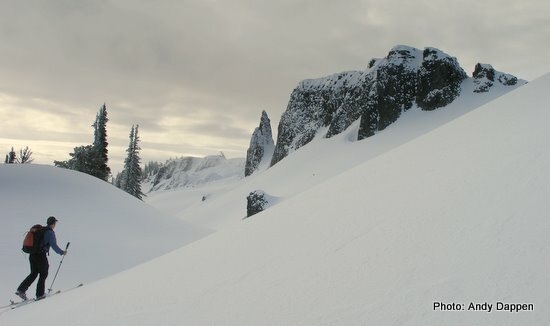 We find pockets of good snow, open slopes with firmly frozen corn snow, and glades with breakable crust. Transitions between the variable surfaces sometimes switch in the blink of a turn. 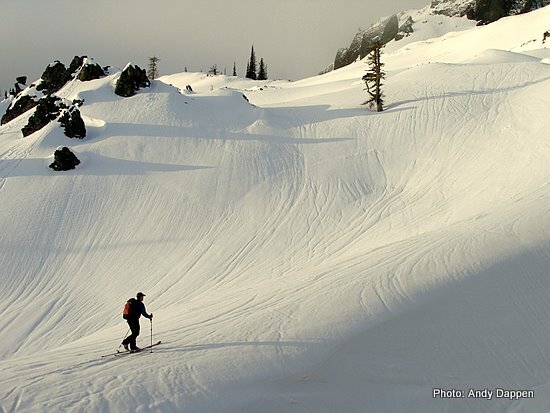 Despite the moderate pitch, any time you can launch over ski tips and bury your face in snow peppered with basalt boulders the skiing is interesting. 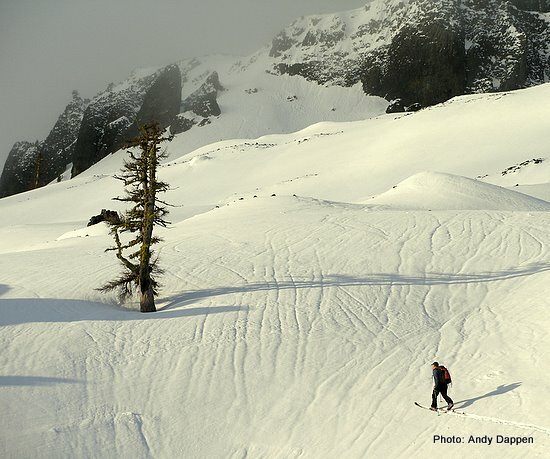 The skiing gets even more interesting in the forests below Clara Lake. Here the frozen trail bordered by high berms of snow trap the boards in a luge course. The skiing is too fast if we confine ourselves to the conduit of the trail yet, too forested to ski anywhere but on the trail. We’re continually looking for ways to scrub speed and stopping frequently to rest legs from the aggressive snow-plowing required to brake. Two thirds of the way down, I look at my watch and realize I have suddenly fallen behind schedule. I strip the skis and run down the remainder of the frozen trail. Tom leaves me at the car. He’s transitioning from a morning of backcountry skiing to an afternoon of downhill skiing with his wife at the Ridge. I head down the road and in twenty minutes am wandering over the grass of Hydro Park toward the chair my wife has positioned along the sidelines of the field. The first lacrosse game is five minutes underway and as I sit down my wife gives me a welcoming smile. Whew, I am within the grace period of not being late. An acquaintance, seeing me dressed for skiing, wanders over and asks if I’m going to miss part of the tournament to go skiing. “No, just back from a tour, I tell him.” His expression changes. I think it’s the look of envy. It could be the look he saves for fanatical idiots, but I’m sticking with envy. Ahhh–a morning of frozen beauty, skiing, appreciative family… and now envy. Life is good. Mission Peak (6,876 feet) lies about one mile northwest from the top of the Mission Ridge Ski Area. 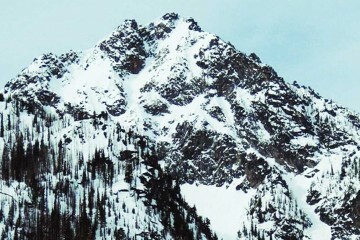 The peak is somewhat non-distinct because other crags along the same ridge system are nearly the same height. The high point is at the northwest extension of the ridge and has an old lookout access road (branching off the Beehive Road) leading to the top. A lookout operated here from the mid 1930s to mid ’40s because the peak is spectacularly positioned for long views in all directions. Activities. 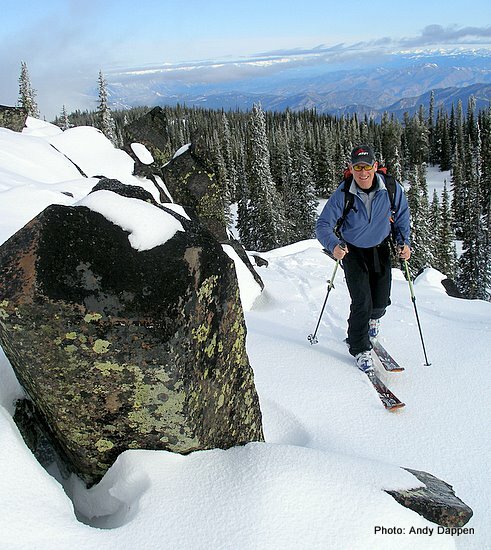 In winter, the peak can be easily climbed by both snowshoers and skiers on either telemark or randonnee gear. Length: 6.5 miles round trip. Hazards. Some of the terrain beyond Clara Lake and some of the summit slopes leading to Mission peak can avalanche. Know how to evaluate the conditions and how to avoid most of the hazards through good route selection. Access. Drive the Squilchuck Road 11.25 miles to the Mission Ridge Ski area. Park in the outer-most margins of the lower parking lot. The trailhead to Clara Lake starts on the other side (west side) of the Squilchuck Road. Follow the trail to Clara Lake. The peak sits southwest of the lake and any number of routes will get you to the top, but many lines will have you climbing steeper than necessary or lead you up a knoll whose back side will need to be descended. One efficient route is to follow a true bearing of 218 degrees to the 6,000-foot level, and then a true bearing of 255 degrees to the northwest ridge of the peak. Once on the ridge, turn left and climb to the summit. (See our map below ). 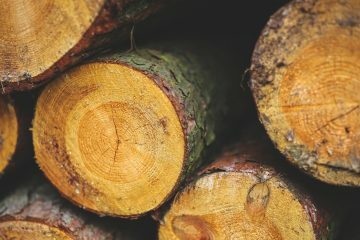 Land Ownership: Forest Service and the Colockum State Wildlife Area. Date: Trip report filed on March 23, 2009. Map. 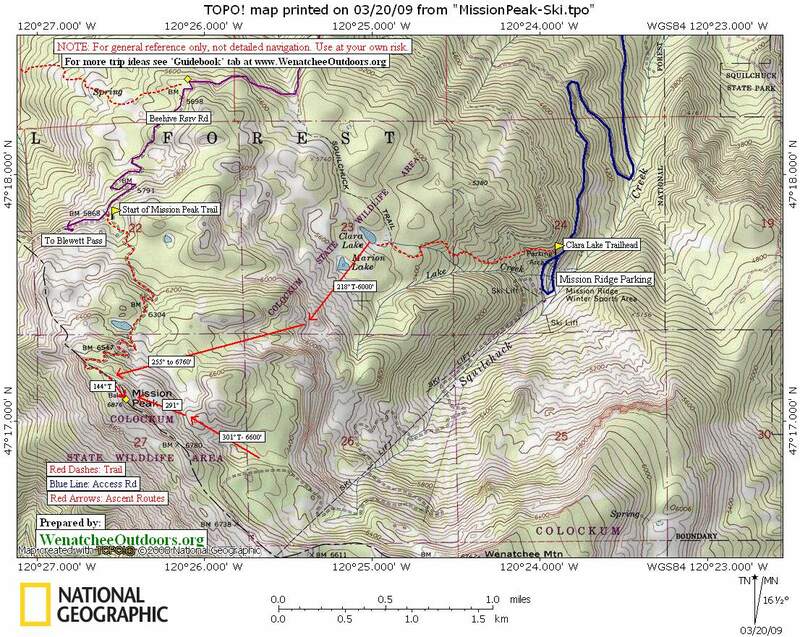 Print our topo map below on 8.5”x11” paper in landscape mode. Note: Use ‘Print Preview’ to properly orient and scale this map before printing.